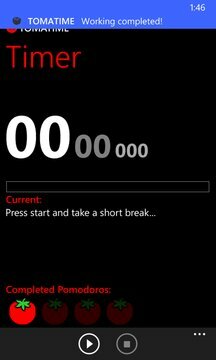 Tomatime timer is a simple timer app. It works also on Windows 8.x, it's an Universal Application. Tomatime helps you focus on your work activities (or Pomodoros), and track tasks or breaks duration with great speed and ease-of-use. It's based on Pomodoro Technique by Francesco Cirillo, but it's useful in all situations (e.g. studying). 2. Take a short break. 3. Get back to work and start the timer again. 4. Every four activity, take a longer break. 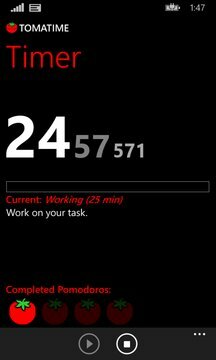 With tomatime you can set the activity and break durations, in minutes.